I think I am starting to sound like a stuck record. It is still winter in the Western Cape. It is not nearly warm enough in my kitchen to prove bread, and even if I could sit the dough outside, it is raining. We have had snow before in October but for some reason this year’s winter seems to have lasted longer than previous years. I am going to start calling myself the queen of the bread maker. This is another trusty recipe you can make in the machine. I must say, that the bread maker has been quite a blessing. I absolutely love fresh bread on the weekends and given the damp conditions here, I would have missed out since April. I used chopped almonds and whole sunflower seeds in this loaf of nut and seed bread, but you can swap out the nuts for any you prefer, just remember to chop them up before adding them. As I made this bread on Saturday evening I did not toast the sunflower seeds beforehand, but it would be worth doing if you have time. If I use pumpkin seeds then I definitely toast them first. I am submitting this recipe to Fresh From The Oven which is being hosted this month by Dear Love Blog and to Twelve Loaves which is hosted by Jaime, Lora and Barb. Thank you for taking part in this months change, it sounds delicious. I understand the problem with proving in cold kitchens, I had to take a panettone I was making last christmas to the pub with me because our kitchen was so icy it was making no progress. 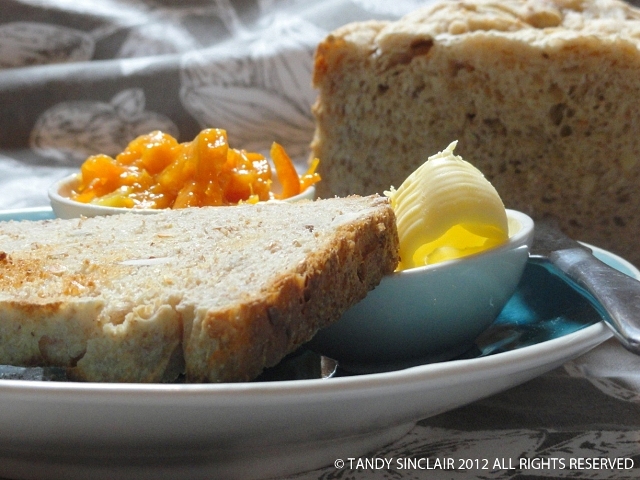 Fabulous bread – and I love my bread maker as it helps when it´s too hot as well as too cold! I am sorry to hear it’s so cold there, Tandy! We have a beautiful day and then alternate with snow and cold rain! I definitely use a bread machine and this looks like the perfect loaf to make in it! Beautiful loaf Tandy!! Looks very healthy and hearty too!! Yeah, it’s never warm enough around here to proof my bread either! I always turn on the oven for 2 minutes, shut it off and leave it in there. haha..
I’ve never made bread before. This one sounds really good! So interesting to hear what you say about using your bread maker, unless our heating is on I can’t really make bread, so I may have to investigate a bit more. Thanks for the tip and the recipe Tandy ! Beautiful loaf! I love the crunch that the nuts and seeds add. Your bread looks so good, so tempting too! I never use a breadmaker because I love to make very dark & healthy bread & those machines can’t stand it at all. Love the idea of toasting the seeds. My rolls for this challenge suffered the other way. Over-proving …just so hot in my house! I suppose you have to get the aircon at the right temperature! I wonder which seeds are from my home town? I LOVE our breadmaker. While I do miss making bread by hand, it has come in so handy the past few weeks, since we’ve been so busy. (And busy= eating more sandwiches, so needing more bread! What a cycle!) Good call on using it when your kitchen isn’t warm enough to proof. We’re headed into that season right now, and I can see myself using my machine a lot this winter. I can image that the smell of this bread baking in your bread maker helps to offset the chill of winter. This post makes we want to buy a bread maker — especially after the recent excitement of making my first loaf of bread! My breadmaker packed up yesterday. Since I had all the ingredients mixed already I kneaded with my hand and proved the dough in the bedroom wrapped under 2 blankets. I am also starting to get serious annoyed with this non-summer weather Tandy – seems global warming is having a big party. The wind is howling here which means the start of summer – it had just better not do this every day or I will cry!